Grizzlies 105, Pelicans 102: The Grizzlies Won? On Purpose? Last night, the Grizzlies got their first win of 2018 in a tight one at home against the New Orleans Pelicans, 105-102. Both teams have their own injury problems—the Grizzlies are still without Mike Conley, and the Pels are without oft-injured franchise centerpiece Anthony Davis. Neither team is performing to the best of their respective abilities at the moment, but the Pelicans are at least .500. The win was the Grizzlies' 13th of the season, putting them at 13-27, currently 7 games out of the playoffs and at the bottom of the West with the Lakers and Kings. The question that I'm left with is, of course, should they have won the game last night? Did they even want to? 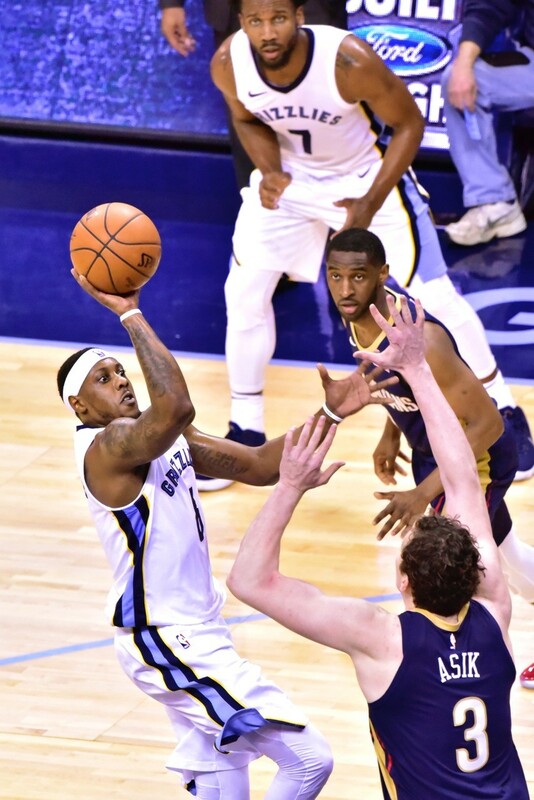 It started out badly for the Grizzlies, who scored 29 in the first quarter but gave up 38, allowing DeMarcus Cousins and Rajon Rondo to get off to hot starts. From there, things started to tighten up (the Pelicans only led by 1 at the half), as the Grizzlies found a bit of an offensive rhythm and the Pelicans' offense started to sputter, partly because of the Grizzlies' defense but also because of their own issues. With Kobi Simmons sent back down to the Memphis Hustle for a spell, presumably to save his two-way days, the Grizzlies played a shorter ("shorter") rotation of 11 guys. Ben McLemore, the Five Million Dollar Man, racked up another DNP/coach's decision. Mario Chalmers and James Ennis got major minutes off the bench (though in Ennis' 25 minutes he attempted and made only one shot, further proving the theory that the guy has to start to be any good). It was a game that the Grizzlies were clearly treating like a "must win," at least on some level, and yet they almost didn't. 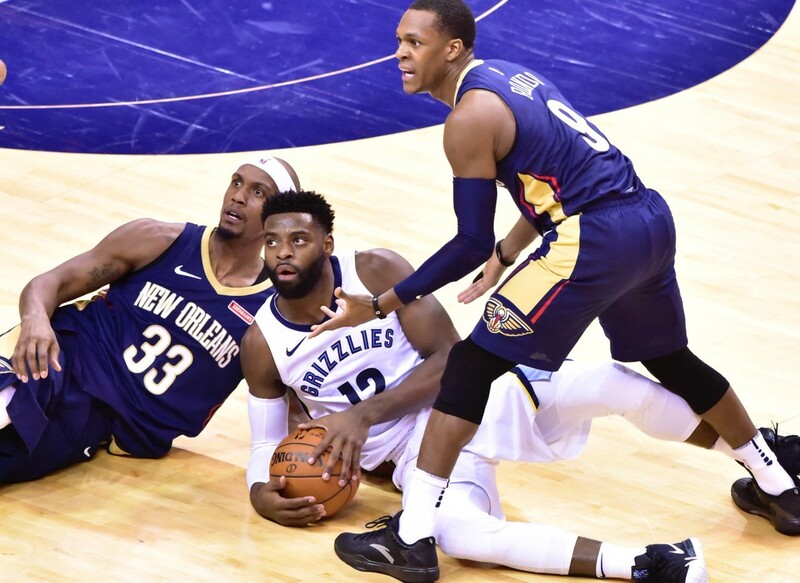 New Orleans, in the end, was crippled by poor execution while the Grizzlies got a few stops when it mattered, once they'd gotten a lead and kept it. It's also worth pointing out that this was JaMychal Green's first really good game in ages. Green has been mostly invisible on the floor for weeks, fouling a lot, looking angry, and mostly not getting the job done. Last night he was aggressive on both ends of the floor, and while he was still pretty mad about a lot of stuff the whole time, he put it into action on the offensive and defensive ends. Green's struggles have been a big reason why the Grizzlies have been so bad defensively lately, and if he can get back on track, they should improve (and/or be able to get more for him if they try to trade him, which seems like it might be the right move if they're really trying to be bad this year). At this point, there's not really anything good that can come from the Grizzlies winning games. If they hit a hot streak in January and start climbing out of the basement of the Western Conference, they're only going to end up finishing in the 10th or so spot and wrecking their chance at acquiring a very good young talent early in a top-heavy draft. However. There's also the morale standpoint, and the standpoint of the home fans, though. Even in the midst of tanking a season, for a fanbase that's used to winning at home and competing in the postseason, I think these small victories are probably important from time to time to keep the home fans from letting go of the thread. Memphis is, notoriously, a front-running town, unwilling to support a bad team. Whether or not this is tenable long-term for a professional sports city is something we can talk about later (spoiler alert: it probably isn't), but facts are facts, and if the Griz don't win a home game every now and then, the already-lighter crowds are going to start thinning out fast. Did They Really Want To? You could make this case either way based on last night. The biggest piece of evidence that the Grizzlies weren't trying to lose on purpose is the DNP-CD next to McLemore's name in the box score. Generally, when he and Chalmers both play major minutes, I assume the fix is in. However: Deyonta Davis barely played. Wayne Selden barely played. The young guys who are the future of this team didn't really get a chance to shine last night, while Chalmers and Brandan Wright and 32 minutes of Tyreke Evans carried the day. Playing the vets and trying to win instead of playing the young guys and seeing what happens seems like a strategy to deploy when you're trying to win. With this team, though, I think the vets are probably worse than the young guys. Think about the 128-point night against the Warriors. When the young guys on this team have it going, they're not anywhere near as bad as they were, say, three weeks ago. It's hard to lose games on purpose when your streaky developing talents start hitting hot streaks. All of that is to say: I really can't tell at this point whether the Grizzlies are trying to win every game or whether they're just trying to look like they want to win every game. That, in itself, is a pretty damning indictment of the way this team is put together, but if you've been reading this season you already know how I feel about that. The Grizzlies should not want to win games, period. They have everything they need to develop young talent, make the games close and interesting, score a lot of points, and still lose, and I think that's exactly what they should do from here until the end of the regular season. Shut Conley down. Parsons seems to be floating out in the "who knows if he's really hurt" ether, as well, because judging from his workout before the game last night, there's not much wrong with him, either. Ride the season out like this, trade Evans and Wright for whatever valuable assets you can get for them, and see if you can dive so deep that you scrape your forehead on the bottom of the Western Conference swimming pool. Gutting out games like the one last night may help you in the short term, and it may keep the locker room from turning toxic, but ultimately it only hurts your ability to reload the team on the fly and bounce back quickly. Omer Asik and Mario Chalmers are engaged in an epic plus/minus battle. So far, Asik's minus is winning. Friday the Grizzlies travel to Denver for a schedule loss game against the Nuggets, and then they return to Memphis for the Martin Luther King, Jr. Day game against the Lakers. The Grizzlies are going all-out on the MLK Day symposium this year; more on that to come later this week.